KOHLER® Power Systems and Bay City Electric Works can satisfy your power solution needs — from residential units to multi-genset industrial installations. KOHLER offers individual gas- and diesel-fueled models from 8.5 kW to 4 MW, as well as electronic controls, automatic transfer switches, and switchgear. KOHLER’s extensive lineup of standby/prime generators power airports, hospitals, factories, and communications centers that all help tie together a global marketplace. All KOHLER industrial generator models are available with an emissions certification and UL listing directly from the factory, with no costly or time-consuming site certifications required. In addition, seismic certification is available from the factory for most models. 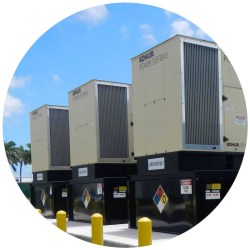 Ideal for standby emergency power, interruptible rate applications, peak shaving to lower energy costs, and prime power installations for heavy construction and mining operations, Bay City can provide you with a power system solution to meet your requirements. KOHLER switchgears are designed to manage your power needs by carefully monitoring and adjusting the load between generators that have been installed to work in tandem. The paralleling of multiple generator sets is a long-accepted technique for increasing the amount of available electrical power as required for variable load conditions. The switchgear will automatically synchronize and match the electrical power from a number of generators to the size of the load requirement. Our strength is the ability to design a complete, integrated system for your installation with one source of responsibility. Whether your concern lies with the simplest functions or the entire operation of a highly sophisticated system, KOHLER generator controls give you the power to manage the application. Each control product is customizable to your specifications and engineered with safety and simplicity to ensure displays and keypad functions remain user-friendly. Our complete line of Decision-Maker(TM) models features innovative network communications for remote monitoring and also include programmable software to accommodate future system upgrades.